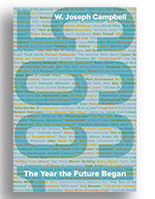 We’re in the runup to the 20th anniversary of the “Netscape Moment” of 1995, the day when a California startup’s eye-popping market debut illuminated the World Wide Web for millions of people otherwise only vaguely familiar with its potential and promise. Netscape was the Silicon Valley maker of the breakthrough Web browser, Navigator. By summer 1995, Navigator commanded more than 70 percent of the emergent browser market. 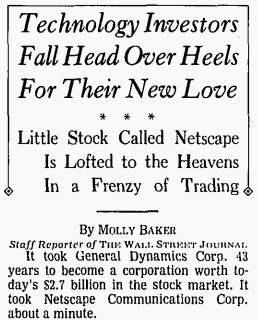 The company had yet to turn a profit, but on August 9, 1995, Netscape put 5 million shares of its stock for sale on NASDAQ, priced at $28 per share. For nearly two hours that morning, an order imbalance kept the company’s shares from being traded: Demand was that strong. Finally, the stock opened — at $71 per share. It climbed as high as $74.75 a share before settling at day’s end to $58.25. The IPO made millions for the company’s founders. The Netscape shares of Jim Clark, already wealthy from having founded Silicon Graphics, was worth about $566 million at the close of trading on August 9. Netscape’s other founder, 24-year-old Marc Andreessen, had a stake valued at nearly $59 million. Netscape was the Internet company from central casting. It had a poetic, pitch-perfect name, and it exuded panache at a time when it was OK to swagger and be brash about the Internet. The company’s IPO was nothing if not brash, signaling as it did that the Web could be a place to make fortunes. And Netscape Navigator was the gateway to the early Web for millions of people. Andreessen could be provocatively colorful. He dismissed the technical qualities of Microsoft’s Windows operating software. He likened the conduct of representatives of Microsoft Corporation to “a visit by Don Corleone” of The Godfather films. “I expected to find a bloody computer monitor in my bed the next day,” he said of a meeting with Microsoft at Netscape’s headquarters in June 1995. At that meeting, Microsoft delivered what Netscape regarded as a heavy-handed threat: Divvy up the market for Web browsers or face the prospect of annihilation. Microsoft was then developing a Web browser, the puny first version of Internet Explorer, which the company bundled with some versions of its Windows 95 operating software. Windows 95 was released in late August 1995 amid much hype and hoopla. 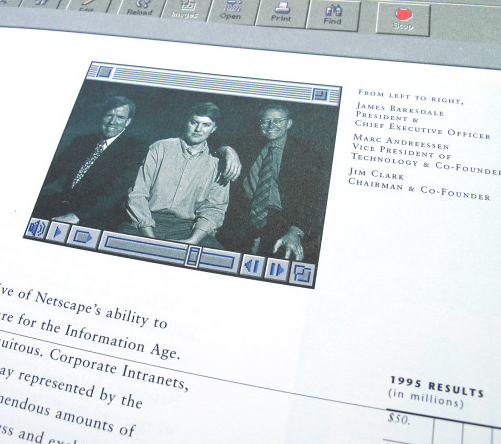 By year’s end 1995, Netscape was locked in a “browser war” with Microsoft. It was a death struggle for Netscape, as later versions of Internet Explorer were technically as good as, or even superior to, Netscape’s subsequent editions of Navigator. Netscape steadily lost share of the browser market and in November 1998, it was acquired by AOL.com in a deal eventually worth $10 billion. And therein lies another reason why Netscape is still remembered, many years after it burst into prominence: Netscape can be thought of as an early victim of the Web’s ruthlessness, crushed by Microsoft and the predatory strategies it employed in the “browser war” — strategies later found to be illegal restraints of trade. This entry was posted on August 2, 2015 by W. Joseph Campbell in 1990s, Anniversaries, Early Web, Internet, Netscape, Technology, Watershed year, World Wide Web and tagged 1995, dot.com boom, Early Web, Hinge moment, Microsoft, Netscape, Recent past.